Happy Feast of St. Clare to all! Although it’s nearly over, we wanted to share with you the second reading from today’s Office of Readings. We enjoyed a delicious feast day dinner (technically, it’s a solemnity for us, so we celebrate with extra special festivity), and our day is nearing it’s end, but we didn’t want to close up shop without sharing this with all of you. Just to warn you, our Holy Mother Clare uses lots of romantic (and scriptural) language when writing about her Spouse. We remember one year when Fr. Joseph told us that he couldn’t quote her in a homily because she was “too mushy.” He must have been referring to the final paragraph of this letter. This entry was posted in Saints & Angels by texasnuns. Bookmark the permalink. Hmm. ‘Tis a bit mushy. Happy Feast Day, Dear Sisters! Heartfelt thanks for all your prayers for me and my family/intentions. What a lovely post. 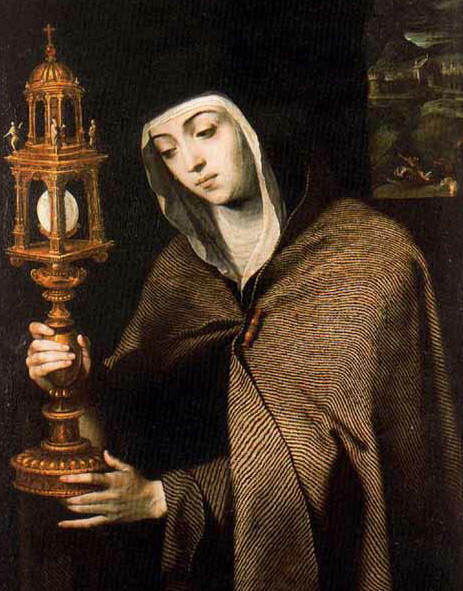 Please visit our blog, Novena.com for more information on Saint Clare. (This year, we have even used the same image as your blog). Much love.